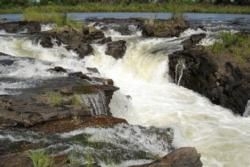 The path of the Okavango River through the Caprivi drives it across a 3m cascading dive, thus creating the Popa Falls. A wooden walkway is built across the river to allow closer access to the rapids as they plummet downstream. Various smaller streams divert from the main river, creating beautiful scenic areas to explore on foot. With campsites on both banks of the river, the area lends itself to a perfect relaxation retreat.